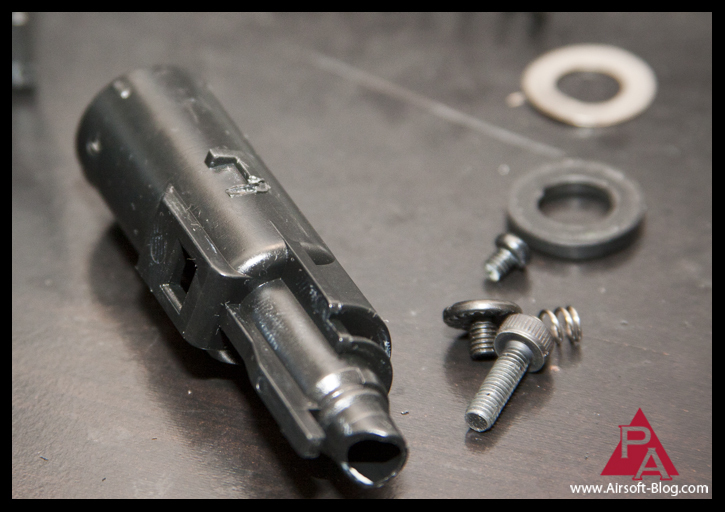 Pyramyd Airsoft Blog: MORE CO2 Damage to the WE Hi-Capa 5.1 PLUS a couple Teasers! MORE CO2 Damage to the WE Hi-Capa 5.1 PLUS a couple Teasers! Loading nozzle #2 for the WE Hi-Capa 5.1R did not fair too well. Can you spot the damage? During the most recent test firing, the nozzle broke within five shots of switching from green gas to CO2 and then proceeded to cause the slide to get jammed quite well, making it rather difficult to release. I think I'm pretty much ready to go on record that while it is a great option for an Airsoft gas blowback pistol, the WE Hi-Capa 5.1R is NOT CO2-compatible as the manufacturer would love to claim. The stock loading muzzle is made of plastic and simply cannot withstand the stress from the increased pressure created by using CO2. I have seen a metal loading muzzle floating around the web, so I may try to look into that, but for the time being, guess who's gonna be sticking to green gas in his Airsoft sidearms? Hint: he's tall, bald and writes the Pyramyd Airsoft Blog. Speaking of hints and/or teasers, check the photo I've got posted after the jump for a hint of a one-of-a-kind new Airsoft AEG for 2011 that I know many of you have been wondering about. PLUS, I've got a teaser trailer for the new Airsoft Squared social networking community. Click here to see the Airsoft photo & video teasers. Can you name the unreleased Airsoft gun prototype that my 5.11 Tactical Series hard-knuckle tactical glove is currently wielding like a mysterious boss? Here's a very cool trailer featuring the A.R.E.S Airsoft Team and brought to you by a very good friend of the Pyramyd Airsoft Blog, www.Airsoft-Squared.com, which is a new social networking community just for Airsoft players. They've been working very hard for the last year and a half to bring us a sweet new place to hang out and talk about Airsoft. The Airsoft Squared site is currently in Beta (Just like the NEW PYRAMYD AIR WEBSITE!!!!!! ), but its grand opening to the public is coming within the next week. I have been granted access to the Beta site and I can assure all you Airsoft addicts out there, Airsoft Squared is going to be a sweet place to visit. They've done a great job on the look and layout of the site and I think you'll enjoy what they've got going on. When you join up, feel free to add me as a friend (just like you would do on Facebook). My handle is The9thTemplar and I love Airsoft.